Wild Horse Girl is on the Welcome Page, just click" Welcome" up in the navigation bar. But Jenny won’t give up. She goes against her parents’ wishes. carries on despite her catty female cousin, Anastasia. “One chance,” Jenny conceded, even as she thought it was probably a bad idea. For a reading sample, click the cover illustration or use the drop-down "Samples" menu in the navigation bar. go straight to the page at Amazon. This story takes place in Portland Oregon, but is not yet published. 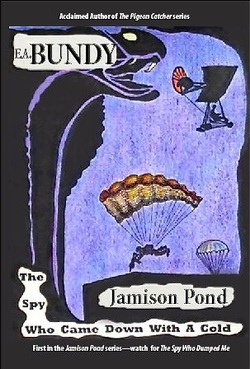 In fact, it's the first in the Jamison Pond series. He only has one friend, 13-year-old Min, but she can't be for real. When his guardian disappears, the truly disturbed headmaster requests Min take Jamison to her home in her daddy’s limo. Things turn, uh...interesting. Mercenaries invade her penthouse, classmates are kidnapped, a deadly black cobra attacks, and Jamison finds he has a knack for doing things he never—Oops, can’t tell that part. Is the Boy genius in a wheelchair an enemy or ally? Especially, with blood on his mouth. Girlfriend says she’s a witch. Weird new dude likes her. A nefarious villain pulls strings behind the scenes. Murder in a Salem Oregon mall—also lurks inside several Independence, Oregon doors. or join forces to attain victory? To read more, click this cover illustration or use the drop-down "Book Samples" menu in the navigation bar. 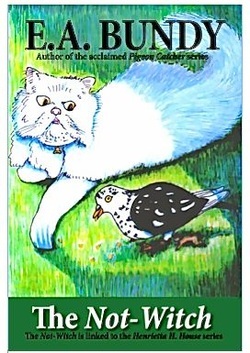 He dangles cloud-high from a pigeon’s leg in whistling winds. Life ruined, he must find the witch, but not an ordinary witch. No. She's The Not-Witch! Not-Witches, results in a fascinating journey unlike anything you’ve ever read. A mesmerizing tale you won’t want to put down. Some people might have thought that, but I was actually in the mountains of Peru. Seen in this photograph taken there while doing research for Matt and Mimi Among the Incas, a book I am currently working on, which I refer to as M&M, for short. It is set during the time when the Spanish invaded the Inca empire. 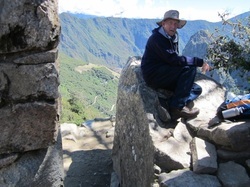 I love writing the M&M story as much as I love Peru, particularly Machu Picchu, Cuzco and Lima. I won't say any more about all of that for now since the book is not completed. There is an informational Bio page of mine that you may visit. Just click BIO up in the navigation bar below the banner to learn more about my current writing projects.